Do you like the Windows Mobile Device Center (WMDC) does popup every time you connect a mobile device to your (development) PC? If yes, don’t read further. 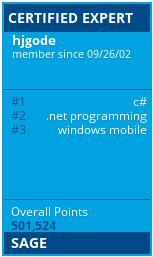 The attached application (including VS 2008 C++ source code) simply watches the Window list for Windows Mobile Device Center and Windows Mobile Member Center. If a window is found, it will be hidden automatically. Very simple application. WMDCautohide will reside in the notification area of your Windows 7 PC after you started it. If Mobile Device Center has been found and hidden, there will be a short notification. You can right click the notification symbol and then either show/hide WMDC, show the main window, set the watch interval or exit the tool. wmcdbase.exe is just the ‘lite’ version of the tool. It doesn’t display the WMCD screen every time you connect the device. I also learned today that you still need to use the old “GuestOnly” registry entry if you want it to work properly. So in conclusion use both of these and you should be all set. I’ve rebooted a number of times to test it and it works great. Just know that you have to manually run wmdc.exe under “C:\Windows\Windows Mobile” if you want to change any of the sync options. Or you can just change the 1st registy entry back by removing the word “base”, and rebooting. Note from HenkA: This solution works, but is a bit strange, as the files wmdc.exe and wmdcbase.exe are identical in every byte. Only the names are different. thanks for this usefull information. There is only one issue: you can not see any more, if a device is connected or not. Possibly I will have to write a small app that monitors WMDC/ActiveSync connection and displays a little status in the notification bar like ActiveSync has done.